In London traffic congestion has probably been a problem ever since the city was founded in Roman times - for example average traffic speeds are known to be similar today to what they were in Victorian times when it was predominantly horse drawn. Although cycling has increased in recent years, and bus usage increased due to massive subsidies to bus operators, traffic congestion is still a major problem. This is frustrating to road users, economically costly in wasted time and results in greater atmospheric pollution. The Greater London Authority and Mayors (of different political complexions) have established various strategies to tackle traffic problems in London over the past fifteen years as part of their overall Transport Strategy. The adopted policies have been ineffective and congestion has actually got worse. For example, the Congestion Charge tax has not reduced traffic congestion and it has actually got worse since that was introduced. Go to Congestion for more evidence on that. One reason is because there is simply a very large “unsatisfied demand” for more road space and this gets worse as the population and level of business activity in London rises - as it has done rapidly in recent years. In 2016 the Greater London Assembly Transport Committee undertook a "Scrutiny" of Traffic Congestion in London. The ABD's submission to it can be read here: Congestion-Scrutiny. In summary however, the GLA has no plans to significantly improve the road transport network in London and believes that public transport is the only solution. The ABD does not agree with this strategy and suggests that improvements in the road network should be undertaken, particular in the outer London boroughs and on strategic routes. In practice road space has been reduced rather than increased. There are other changes than could be made to reduce congestion - for example by removing unnecessary traffic lights. One thing a former mayor was keen on was more tram or light rail systems, but they have proved to be very expensive to build and operate and new tram systems have not been built since the Croydon system. More public transport systems and increased support for cycling will not reduce congestion - enormous amounts have been spent on those solutions, with very little impact. Mayor Sadiq Khan published his proposed London Transport Strategy in July 2017 and it’s basically an attack on private motorists, and Private Hire Vehicles (PHVs), with more congestion charging (or road pricing) proposed. Indeed by imposing higher parking charges, workpace parking levies and other restrictions, he aims to reduce car use, reduce our transport choices and generally dictate our lifestyles. More information on this and the ABDs campaign against it is present here: Against-MTS . Please study the information and register your support. 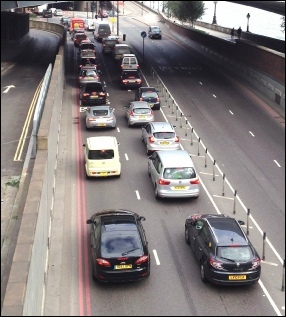 Picture left- traffic queuing at Blackfriars due to work on the Cycle Superhighway.